Why does a sidewall "blow out" when you run on low inflation? The title for this post is essentially the exact question I was asked. "Tireman9, can you explain why, when the tire pressure drops below a rating for a tire, that the sidewall of the tire blows out with great force? What pressure drop will cause this type of damage? When the tire blew it had enough force to damage the motorhome with the rapid escape of air that made a large bang when it blew." The mechanics are essentially the same, be it a textile (usually Polyester) tire as are most P, LT, and ST type tires, or for tires with steel body cord as most commercial grade LT tires and "TBR" Truck-Bus Radial" tires. These cords are referred to as the "body ply". I think we all realize that tire sidewalls bend when loaded. This can be observed by simply looking at the bottom (near the road) vs. the rest of the tire sidewall. The amount of bending is essentially just a function of tire size, load and inflation. This bending includes some stretching of the outer surface of the tire and of the rubber surrounding the body ply. This stretching results in some heat being generated. You can test/experience this heat generation yourself with a simple test of holding a rubber band against your lip and stretching and releasing the rubber band rapidly. Your lip is sensitive enough to feel the temperature rise of the rubber band. So what happens if there is a leak of inflation air? Or if the tire was not properly inflated in the first place? With lower air pressure the amount of bending increases and with an increase in bending we see more heat being generated. Increased heat generation means increased temperature of the rubber internal to the tire structure. Since rubber is a good insulator, heat transfer can be slower than heat dissipation to the outside air so the temperature can continue to rise ever faster. The strength of the rubber decreases with an increase in temperature which allows more bending. With slower heat transfer from the internal structure to the outer surface and increased heat generation as more air leaks out, I think you can see how it is possible to get to a point where there is something like a chain reaction or "runaway" temperature increase. The above heat generation can also result in the polyester experiencing a rise in temperature with the associated loss of strength. You have seen the effect of high heat by holding a match near the end of a piece of Nylon or Polyester rope and see the textile melting. In the steel body ply tire the increased bending can result in a fatigue failure of a steel cord. You can test the fatigue with a steel paperclip. Simply bend the paper-clip a few times and it will break. In the case of a tire the number of bends to failure can easily be in the thousands. So what you are seeing when the sidewall fails is the result of dozens, hundreds or thousands of miles of excess rapid flexing of sidewall rubber and sidewall cords. If the bending is great enough the materials that are being bent simply fail. An explosive loss of air can occur if/when the force of the remaining inflation exceeds the strength of the body cord. Since there is an almost infinite combination of load, inflation, bending and speed involved, it is impossible to give an exact answer as to when the sidewall will finally fail. If we have a large tire we can have significant force involved even at relatively low pressure. 20 or 30 psi can easily generate over 30,000 pounds of force. New GY Endurance only available in higher Load rating. What to do? At the end of next season I plan to replace our GY Marathon tires after 5 seasons and about 20K miles and have been thinking of the new Endurance tire. However, the specs. are somewhat different between them and am not sure what to do. Our Marathons are LR-D ST225/75R15. I always run them at sidewall max. pressure 65 psi. The max. load rating is 2540 lbs and gives us about 30% reserve load capacity. The required rim width is 6-7”. The standard tires for our make and model of travel trailer are an unknown brand LR-C and the Marathons were an available option so we upgraded to them. No issues whatsoever with them. I do not know what the max. psi rating for our rims is without taking one off. They are 6-lug. I like the idea of having a 225 wide tire vs 205 because I *think* it may provide better handling from lateral forces in curves. I have our TV & TT set up for better handling including shocks on the TT. It performs very well in twisty mountain roads at speeds up to 65 mph. If we were to get the new Endurance tires in an ST225/75R15 width, it means going to LR-E tire which have a max. 80 psi rating. The load rating increases to 2830 lbs. Required rim width is still 6-7”. The increased reserve load capacity would be fine. I have no idea if our rims are rated for 80 psi and would have to remove a wheel. I believe in the practice of running the ST tires at the sidewall max. pressure to get max. reserve load capacity. If we were to go with an Endurance tire in a 65 max. rating, it would mean going to a LR-D 205 wide tire and the max. load rating drops to 2150 lbs. I do not want to reduce the reserve load capacity that much and would rather not have to go to a skinnier tire. What to do if going to Endurance tires? If our rims are only rated to 65 psi, could I simply reduce the LR-E pressure to 65 psi? Have not looked at load tables to see what this does. Or stay with LR-D and have skinnier tires and substantially less reserve load capacity? Are tires rated for and inflated to 80 psi going to result in better handling or perhaps an undesirable harsher ride for the trailer? Not sure why GY did not make the Endurance a direct one-to-one swap for Marathons. It looks like GY no longer offers the Marathon? Comments would be greatly appreciated. Your 30% reserve load capacity is good. I wish other trailer owners had as much. You may not see any benefit in increasing the reserve load above the 30%. The reserve is based on actual scale readings, yes? I would not go down to the ST205 @ 65 psi. I see no problem with running the Endurance ST225 LR-E @ 65 until or unless you confirm higher rim psi rating. It may not be marked on the wheel and I doubt the wheels are "brand name". When you change tires you can look for anything that might ID the wheel such as part number. If the wheels are only 65, then 65 is OK. Yes, in my posts on Interply Shear I have suggested increasing inflation, but your CIP should not exceed the rim rating (all ratings are for cold inflation pressure). LR-E ST225's have same load capacity when inflated to 65 psi as do ST225 LR-D at 65 psi. Saw a thread on run flat fixtures to be used on the front of an RV to provide some protection against losing control if a front tire were to fail. A lot of discussion and conjecture but not many facts. Before I start it's important to be sure we all are on the same page with these terms. "Run Flat" capability in today's tire market is a reality for passenger car tires. Tires designed and so labeled can provide mobility at reduced speed for various number of miles even after a complete loss of air. Some advertise 50 miles at 50 mph. I know of no true run flat tires for LT, Truck or RV application. "Blowout" is a generic term used by many to describe a tire failure. This term does not provide information to tire engineers on the condition or possible cause of the failure. "Rapid Air Loss" or "RAL" is any sudden loss of all the air in a tire. "Belt or Tread Separation" -- This is when the belt and or tread portion of a tire separates from the rest of the tire. The carcass or body of the tire many times will still hold air. "Run Flat Device" -- This is some equipment that fits inside a tire. It may prevent the beads from De-seating from the rim or may limit the collapse of the tire after the loss of air. "Steering Stabilizer" -- This is vehicle equipment that may lessen the "jerk' of the steering in the event of an RAL. I do understand the concern of some about the loss of control of a large RV in the event of a front tire failure. Yes, I have seen some of the videos and they are spectacular, but a front tire failure does not have to mean you will have a crash. Back in the early '70s I worked extensively on a new type of tire from Firestone, the LXX, which was intended to replace 10.00-20 and 11-22.5 size tires but used a 26.5 rim. I even spent a week in Texas at the test track intentionally puncturing front tires with a 2" diameter hole to test vehicle control. While the tire worked as designed, the cost of new wheels made the tire design not viable in the truck tire market. Here is a picture in the Akron newspaper at the time showing the tire with my then boss Ed Henry. The main challenge for vehicle control is to either limit the "drop" when a tire suffers an RAL or to limit the steering response which can send the vehicle into another traffic lane. Tyron is designed to keep the tire on the wheel. It does not appear to lessen the collapse of the tire. Rodguard inserts for 14" to 17" tires appears to partially support a flat tire. Safe-T-Plus steering stabilizers take a different approach to vehicle control. Hutchenson seems to focus on extreme situations, such as military applications. I recall hearing about multi-piece inserts like this one from TAC but was not able to find current info for 22.5 RV size tires. 1. Use a TPMS and have it set to tightly monitor your inflation. Test your sensor to confirm it reports pressure loss at the level you expect. It may not be set correctly and a test can confirm. 2. Closely inspect your tires at least annually and if possible even have your tire dealer check for out-of-round or lateral wobble of the tread and bulges in the tire sidewall. These can be early warning of separations or other structural damage to a tire. 3. Study and review the safety videos on how to maintain vehicle control in the event of an RAL. Here is one from Michelin, and another, and yet another. Saw this question on temperature and pressure increase on a new set of Goodyear Endurance tires. "Took our first trip with the new Goodyear Endurance tires. Trailer rode great, better than the old tires. So, on this first outing I closely monitored the TPMS to see if there were any differences in the readings I had with the old tires. The first thing I noticed was how quickly the tire pressure increased once we got on the road. 87 degree day, 60-63 mph, tire pressure on sun load side got to 75psi (73 - 74 psi on shaded side). Tire temp got to 96 - 97 degrees (99 degrees on one tire briefly). This compares to the average 5 - 8 psi increase I experienced on a typical trip with the old tires. This brings me to my question. Is a 10 - 12 psi increase in pressure considered acceptable? If so, what should I set the high pressure alert at on my TPMS?" The temperature and pressure changes are reasonable for most 14" - 16" RV tires, especially trailer applications, but I will focus on your question. Not sure if your "test" is "scientifically" sound -- You were comparing two different tires (LR-C vs. LR-D) and a new tire vs. old used tire. New tires will always run hotter than old tires. With nominally dry air the pressure will increase by about 2% for each +10F. 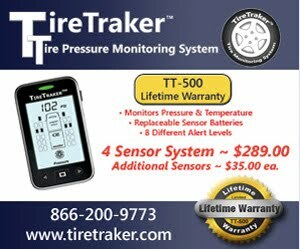 One other related item is that aftermarket external TPMS are not reporting the temperature of the hottest areas of the tire which is internal to the structure. Also while it may not seem reasonable, it has been demonstrated that the temperature of the air inside a tire is not uniform. It is also known that the metal body of valve stems and the metal body of the sensor will be cooled as it whips around in outside ambient air which will result in a lower reading. In all probability your tire is actually 20 F to 30 F hotter than the TPMS is reporting, but this is within the expected design limits considered by tire engineers. New tires do run hotter than old for a couple reasons. Extra stress as initial cross-link chemical bonds are broken as tire is "broken in." This takes about 100 miles. New tires have deeper tread depth, which will also make a tire run hotter, which means more pressure growth. Your GYE have extra components (mass) in the tread. Read the sidewall and I believe you will see Nylon cap plies in the tread which were not in the old GYM tires. This is another contributor to more heat. To your question on pressure increase setting for TPMS. As I covered in my blog post on TPMS settings I figure that +25% from baseline is a reasonable number, but obviously the pressure you select for your baseline may affect the top number. Bottom line. Your numbers look normal and acceptable.